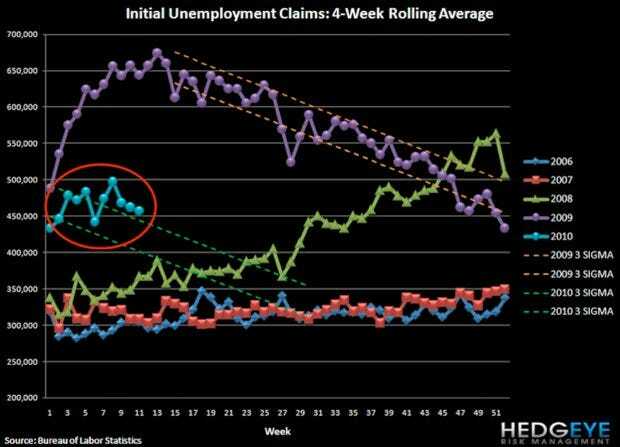 This morning’s unemployment data is out and while claims are dropping, investors continue to worry about a possible uptick. Hedgeye: It is worth noting that next week, barring a significant uptick in the printed number, the rolling average number should fall materially. 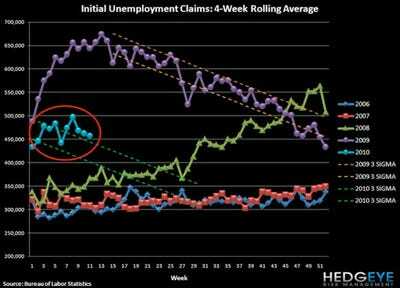 If next week’s claims number is flat week over week the rolling average will fall by 10k – a large enough number to get people’s attention, though still not enough to get claims back inside our 3 standard deviation trajectory. As we’ve said over the last few weeks, we continue to expect to see a claims tailwind throughout the Spring months as census hiring picks up and weather-related effects dissipate.